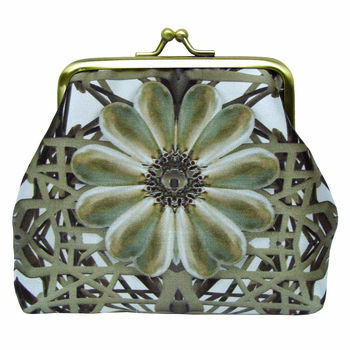 A silk clasp purse in an exclusive print by textile designer Emma Burton. This is a beautiful handmade silk purse with an exclusive print that would complete an outfit for a special or everyday occasion. It is just the right size to fit your money, credit cards and even a lipstick or two whilst being compact enough to fit into a small handbag. It has an antiqued brass kiss clasp closure. This Pink Stone print features photographs of a vintage pearl pendant and flourescent pink spray on a New York street. Printed, designed and made in England.